Speed Demos Archive - Tomba! 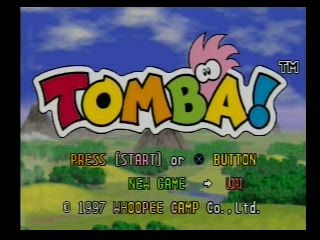 The July '98 PlayStation release, Tomba! (or Tombi! in Europe), was an energetic and creative mix of puzzler and platformer from ill-fated developer Whoopee Camp. Pink spiky-haired Tomba's quest to find his grandfather's stolen bracelet leads him into a somewhat strange war against the Evil Pigs who are causing chaos around the land, armed only with a spiky ball on a chain and his favourite pants. Best time: 0:41 by Robert 'RJWaters2' Ashbaugh on 2007-10-31, done in 15 segments. I thank nate, DjGrenola, Radix, and Mikwuyma for keeping the SDA through the good times and the bad. Special thanks to the verifers and all those on the Tomba! thread. This game was always good fun and fun-stration as a kid, so I chose it for my first speed run. I'm happy to say I've improved two minutes since my camcorder-quality Youtube run. I started planning this run in early July, and finished my final (2nd) run on Halloween of 07, and I'm certain I wasn't the only one running on Halloween. At least I hope I wasn't. I was supposed to land on the first pig, but missed. Tomba is much more annoying to control without Animal Dash. The two cutscenes in this segment are frustrating with all the restarts. Thanks to this run, I have memorized the 100 year old man's speech. Getting hit by that spike plant past the Wobbly Wharf doesn't slow me down too much. The KGB (AKA the purple guy) of the dwarves give me a hard time leaving the village. I smartly save in Watch Tower instead of the village, like my old run. I don't know why, but falling that far away from the 1st freed dwarf skips the "freeze time while I hoopla" thing. I get the Jumping Pants here, instead of on the way to Mushroom Forest. I feel wicked after doing the spores correctly. I am no fan of Baron's time freezing ability either. Instead of the .01% chance of doing the jump off the pump rock to baron's first spore correct, I do the 50% chance of phasing through onto the roof and jumping to Baron. I still fail! I jump one spore too short. I get the last dwarf on the way back this time. After my hour-long celebration, I move on to an hour-long thank-you. Eager to escape, I save back at the Watch Tower. I enter the Charity Square, then high-tail it out. Why...? Behold my botched new route for collecting one Healing Mushroom and getting happy. I accidentally get happy before getting sad, then purposely get happy. If you jump to where the cutscene with the mice happens and hold up, you can read the sign (and save) without triggering the talking. When you load, it still does the scene, so I don't do it. I successfully get through the mountain leaving Charles hanging. Note that I'm still happy. I go to Lava Caves...then leave. I get hit by a Needlegator, and recover too quick for a restart. Another cutscene. As you can see, I'm no better at going up and down stairs at Town Hall. This time around, I leave some eggs for the way back, because I can mash X going down stairs, but not up. I talk to the orange mouse by the pub to spawn the Orange Pig Bag chest. Tomba wanted to die, but ended up collecting Large Key Panel 4. This route for the Mansion is faster and cleaner looking. Tomba leaves no egg behind. Your eyes do not deceive you, I start talking to the 1,000 year old man in midair. This is the segment I start doing the quick text-skipping. I don't know if it was faster to fly to Baccus Village instead of after getting the Yellow Pig Bag. The saving of this segment is not shown because of my awful DVD recorder, it stopped recording to update the information, right then and there! This time, I beat the Green Pig before getting the last key piece, it's quicker that way. I don't do the fast text skip with the Pig's jammering so the bag will face the way I need it to when I throw him(?). I glitch through the edge of the middle platform with the pig, getting a boost up to the bag. I actually planned the 'route' of using the key panels, for fastest use of them all. I perfectly go up to the Pink Pig Bag, much faster than the pegs. It is not easy to grapple to those Charity Wings, and one wing will fall into the abyss if you don't get it right. Small trouble with the Healing Herbs. The jump after the Red Pig Bag is a big timesaver. Quick Pink Pig battle makes up for it. Mmm. Mmmm. This is my showcase segment. I get a different set of Bunk Flowers, quicker than my last run. The Funky Parasol is useless, just slowing me down. Not that I have it, having grown warm to Charles' Pants. The Pignose Bat at the end saved me from having to grapple up to the platform. Epic-est cutscene to end my favorite segment. I actually get hit on purpose. Tomba seems like a true Jungle Boy here. Then I get hit accidentally. The spikes are a quick way back to the miner. I have a bit of trouble with the blasted Clock Tower chains. Quick to Charles, quicker back to the village. The Iron Factory has the best music. I jump too late to learn about the bomb. I get the bomb found message and activate the "Z0mG a D0oR!!~!" animation at the same time to save time. I take on the Orange Pig easy. I didn't flinch at the huge boulder. Blow up a door, yada yada, can't jump over the pond, oldyface, get hurt on the plant, good use of a wing, real use of the quick text skip starts here. I'm not too concerned about Mighty Fish Food. I finally give purpose to entering the Charity Square before. Shortest segment, most annoying Pig. Two free wings are worth the "omg fountain". While quicking the text, I pause and unpause twice, that's how frantic I get. I balance on that peg, too. I fake the barrier before getting the 5th bead, then activate the barrier before getting the 6th bead. Really good text skipping. I fake the barrier before getting the Pig Bag. I couldn't hope for a better Old Tree Hill. Unbelievable text skipping with Dwarf Nurse. Didn't get hit by the Bonsugee! Gracefully defeat the Navy Pig. More random than the Red Pig, but at least there are spawn points to get it in! I hate, you, Red Pig!! Baron, underground, wire, wire, Y-crossing. I don't quickskip the text for the Yellow Pig because it only would spawn where it did, and the bag would face the wrong way. The blue pig wouldn't spawn where I could throw him in, so I had to bite the bullet for this result. I am ashamed it is so slow. I was so frantic with the text skipping, I jumped 3 times before going to the menu! Dwarf friend, Former Mouse friend, 3 civilization friends, the last friend is too risky. Last friend, quick. Evil Pig of Time? More like Ebil Pog of Chumptown! mirite!